Thinsulate insulated Pretty Pinks Kup Kollar on juice glass and Music Krescendo Kup Kap on cup & saucer. Four days before the Caffeine Crawl, Perry had a business meeting in Boulder. We stopped in at Ozo Coffee because our son recommended the shop. Perry ordered a 12 ounce cappuccino in a latte cup. He said it was excellent and was pleased to have two full shots. His orange scone tasted homemade and fresh. My refreshing orange juice was poured behind the counter. The staffer asked if I wanted it over ice. My chocolate chip cookie was soft, chewy, and delicious. The friendly staff gave us excellent customer service. They were upbeat and seemed to enjoy working the coffee scene. The shop was very busy the entire time we were there. Our second Boulder Caffeine Crawl stop was Ozo Coffee on Pearl Street. The staff brewed the same coffee and a 1 to 17 ratio of coffee to water measuring to exact gram in three different brewing methods - a French press, Chemex, and Pour over coffee brewers. The Crawl walkers watched and learned while the staff demonstrated the three brewing methods. The staffer is labeling the sample cups with the name of the brewing method used. 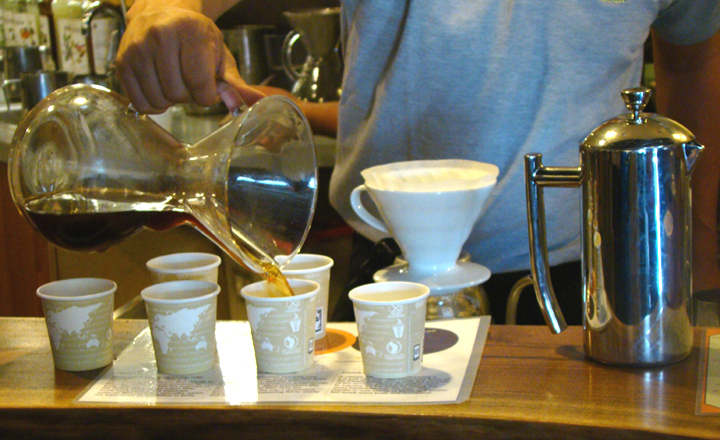 The staffer is pouring coffee brewed in the Chemex into the sample cups. Samples drunk! Perry's taste buds reported, "The Chemex produced an intermediate medium robust flavor and carried a floral taste. The Pour over had a lighter, weaker flavor but isolated the flavors of the beans. My favorite, the French Press, brewed a bold, strong coffee with the flavor of all the beans blended together." The staff patiently answered questions from the Crawl walkers. Perry, my loyal helper, took notes for me while I shot photos. Enjoy more 2012 Boulder Caffeine Crawl photos!